Published on April 13, 2011 by cara.b.b. anyone who has known me for a while could tell you that i’m a magazine devotee. i’ve even referenced in style as my personal bible. my attention span is short (hence the title of this here blog), and magazines cater to my impairment perfectly, jumping from the shoes of the season to the fabric i have to have in my living room to the greatest mascara (cover girl lash blast, in my humble opinion – the orange tube, ladies!). now, to keep up with the times, i also follow a ton of blogs. see that list over to the right? that’s not even all of them. i think it’s kind of awesome that just anybody with a few thoughts can start writing and other people will read those thoughts and maybe even comment on them – whoa! i think the world just got a little smaller, and i love that. hugs all around. see, technology isn’t going to be the demise of our generation….well, probably…it’s bringing people together that would have never kept in touch or maybe even met. pretty darn cool. i love getting to take a little peek into other people’s lives, getting a bit of inspiration from their home, picking up a new way to photograph or put an outfit together. so thank you, bloggers, i like what you’re doin’ and you should keep doin’ it. (no, i’m not giving myself a pat on the back here – i know i’ve got work to do) my new favorites are: amber interiors, kendi everyday, and catherine clay photography. my longtime faves are: bryn alexandra, dear baby, and little green notebook. if you have an interest in interior design, fashion, or photography, you should check these out. heck, i really didn’t set out to write a blog on blogs, but that’s where it went. 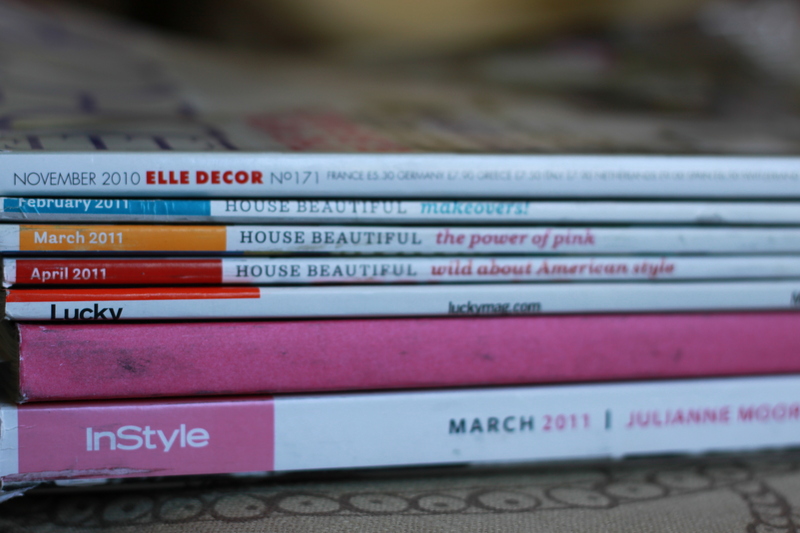 my point today was actually to show you the stack of magazines i’ve been neglecting. (sad face) yes, there’s one in there from november – don’t judge. i’ll get to them one of these days.